“I believe the work of this class is important to the present — and to the future. What can history teach us now, as we work to invent the future? How can we make sure that the technologies we invent will contribute to making a better world for all?" Project catalyzed by President Reif. The first class of the "MIT and Slavery" (21H.S01) undergraduate research project took place in the Fall of 2017. Set in motion by MIT President L. Rafael Reif with SHASS Dean Melissa Nobles, the course was developed and taught by Craig Steven Wilder, the Barton L. Weller Professor of History, and the nation’s leading expert on the links between universities and slavery, in collaboration with Nora Murphy, the MIT Archivist for Researcher Services. Initial findings. The initial class findings include, among others: insights about MIT's role in the post-Civil War era of Reconstruction; examples of racism in the culture of the early campus; and the fact that MIT’s founder, William Barton Rogers, owned six enslaved people in Virginia before he moved to Massachusetts in 1853. Detailed findings will be published on the project website after the Spring 2018 class. New lines of research. The findings also suggest new lines of research. In a focus on these areas, MIT seeks to contribute to the larger national conversation about the legacies of slavery and to lead research on the relationship between the slave economies of the Atlantic world, the fields of science and engineering, and US technical institutions. As part of this effort, Professor Wilder is organizing a consortium of US technical and science institutions to explore such research in collaboration. Community dialogue. As the "MIT and Slavery" research class continues, MIT has also launched a Community Dialogue series "to explore together how to address these new dimensions of our past" and to tell a more complete version of MIT history. This project, MIT and the Legacy of Slavery, is led by Melissa Nobles, Dean of the School of Humanities, Arts, and Social Sciences. The first dialogue event, The Early Findings, was held Feburary 16, 2018, and the second, The Task of History, took place on May 3, 2018. Responding to questions that MIT community members have asked about the "MIT and Slavery" project, four MIT historians — Lerna Ekmekcioglu, Malick Ghachem, Tanalis Padilla, and Craig Steven Wilder — shared insights on how understanding the past can be a powerful tool for shaping the future. Moderated by Melissa Nobles, professor of political science and Dean of the School of Humanities, Arts, and Social Sciences. A community dialogue series is underway as multi-year research continues. The dialogues are an opening chapter in MIT's commitment to researching this history and making it public. A series of events will create campus-wide and community-wide opportunities for shared discussions of the findings and our responses. The first event in this process was held in February, and the second, The Task of History, took place on May 3, 2018. 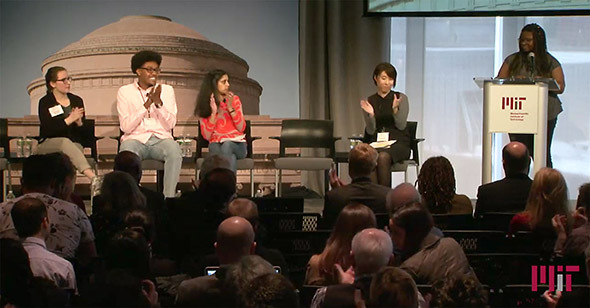 Students bring MIT into national conversation about universities and the legacy of slavery. Research class reveals, explores MIT's connections to the institution of slavery.